In past years Audrey and I have enjoyed fireworks over the Queen Mary or found other interesting ways of celebrating Independence Day, but this year we decided to just stay home. However, when the skies started lighting up around us the temptation to enjoy the scene was too great. With trees blocking the view from the yard, we ended up on the roof, likely causing some concern among our neighbors, but nonetheless providing a pleasant view of the evening’s festivities. Audrey’s work with Indivisible continued with the “Persistence picnic” in mid-July, an event set up to get people together in the park and provide organizations five minutes (each) to speak. Dozens of groups showed up with positive messages and ways for people to make a difference in everything from human rights to voting rights to community issues, and at the end of the day a lot of pessimism about the state of the world seemed to have actually transformed into optimism. In work news, I spent a week working in San Antonio, came back to LA for a week, then went to Spokane for the annual “see what your normally working-remotely co-workers look like in person” week. 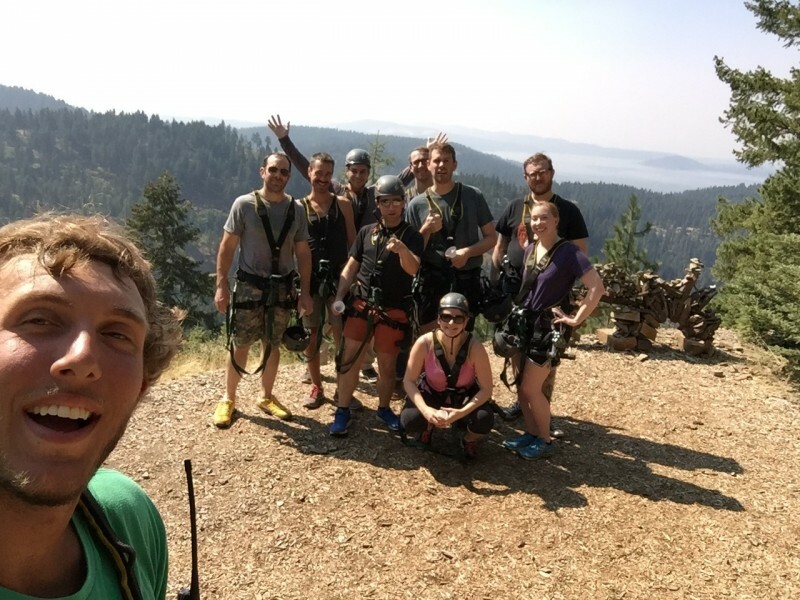 In addition to a team barbecue and a few other social events, we all headed across the state border to Idaho for zip-lining, and it turns out that two of the three senior partners are not fans of heights. Watching one of the two, who is otherwise fearless, go dead quiet on a rickety rope bridge, and then seeing the other, who won’t back down from any technical challenge, literally whimper as he jumped off a platform onto a 400 foot high wire cable, was a humanizing look at my normally unflappable superiors. In the end everyone seemed to have a great time, I was grateful for a chance to be in the trees, and Stuart swore that he’d make sure future events stayed closer to the earth. Some of the team was more enthusiastic than others about hanging hundreds of feet above the forest. 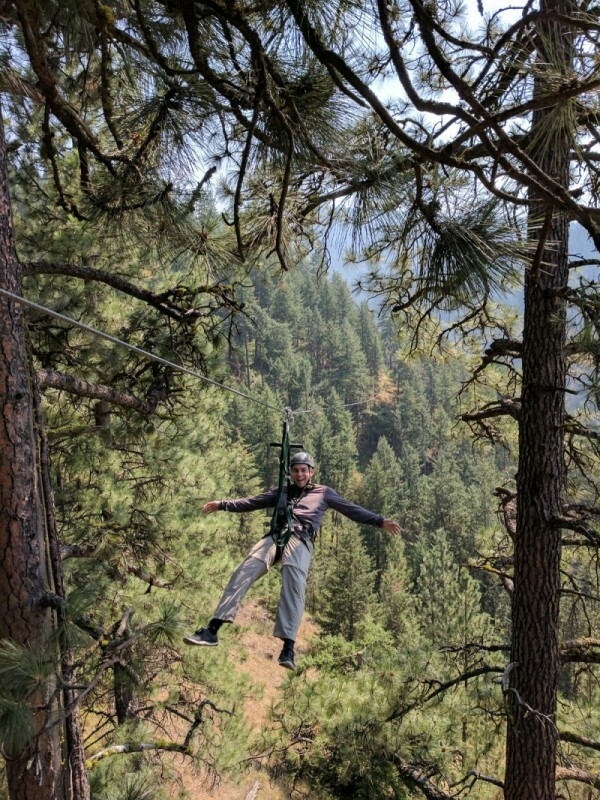 I wasn’t initially very excited about zip-lining, but it turns out that spending the day flying through the forest is far nicer than staring at a laptop.